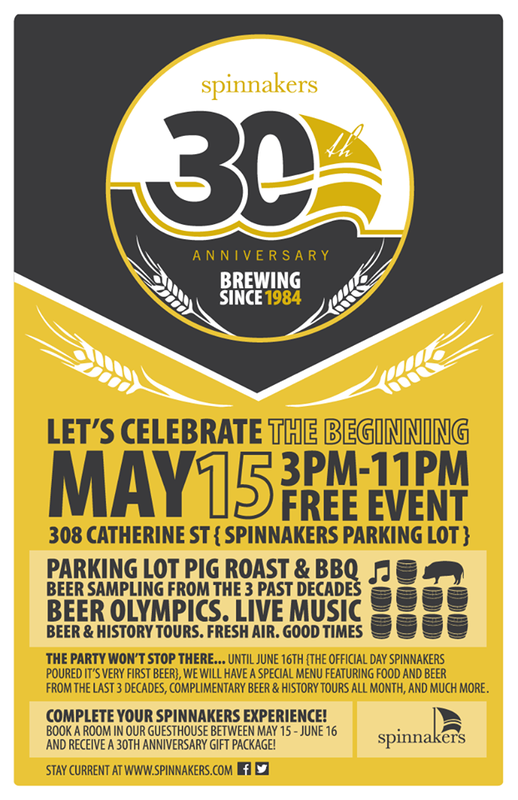 On May 15th, 2014 it was the 30th Anniversary Party for Spinnakers Gastro Brewpub. Spinnakers is the oldest still operational Brewpub in Canada so I had to take a few days off work so that I could attend. The party was set up in the parking lot with an outdoor stage, tents with beer taps and a couple tents selling memorabilia. This is also the first event that I have attended since the BC laws changed for events with alcohol. There are no longer separated beer gardens so people with children could come and enjoy this event and still have beer. There was also a pig roast setup and the pork tasted amazing! I arrived right at 3pm when the event started to really take in the party. Here are some photos of the main event portion. Spinnakers also wanted to involve all of the other Victoria Breweries in their party. To do this they held a beer Olympics with lots of silly games! Each brewery put together a small team of participants and had a ton of fun! The following are videos from the event. Some are from the Beer Olympics and some are from the party itself. Congratulations Spinnakers on your 30 great years in Victoria! Here is to the next 30 years of history for the brewpub. I really enjoyed coming over for the party and I look forward to the next big party you guys throw! This entry was posted in Tasting Event and tagged 30 years, 30th anniversary, anniversary, bbq, bc, beer, brewery, canada, party, pig, pig roast, pork, spinnakers, spinnakers brewpub, spinnakers gastro brewpub, victoria. Wow, this is the live thing you were talking about, huh? Yeah, couldn’t make it to this unfortunately. Looks like YOU had a grand ol’ time! And the wife and I did go there on Friday since we were (sadly) in the neighborhood on the following day. Stupid timing! I finally opened my 30 Yr celebration bottle a year later and wow did it age nicely! It was a enjoyable beer. I was impressed it aged so nicely. If I remember correctly I picked up a second bottle and it should be in my cellar. Not sure if I am going to continue to sit on it or not. Glad its aging well though!